This leg was a Cruise in Company, not a race. That means we had a more relaxed time and were able to stop at a few different ports. First off we were back down the Gierangerfjord for an anchor retrieval ceremony. Sørlandet lost an anchor in the fjord 5 years ago and we went with the other Norwegian tall ships, Lehmkuhl and Raddich, to retrieve it. 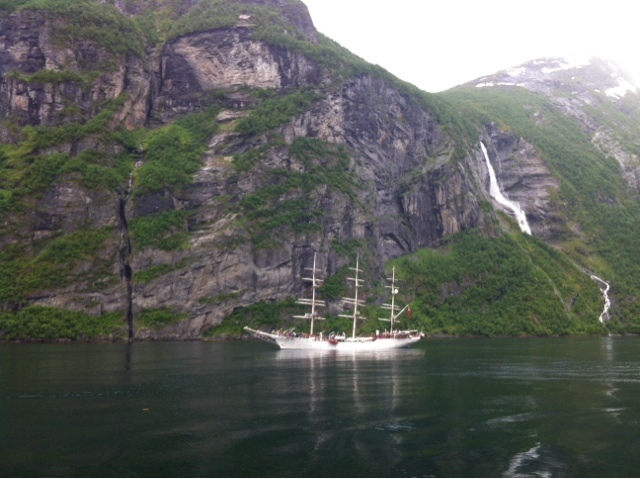 It was a breathtaking scene with the three tall ships in this amazing fjord. Other stops on the way were Rosendal and Sirevåg. 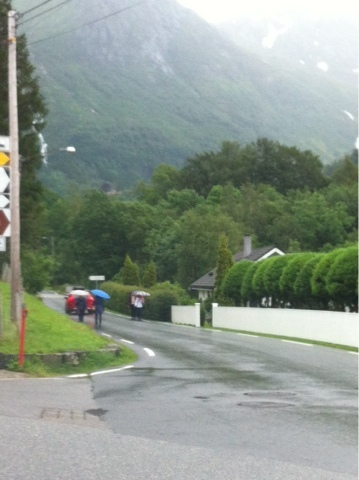 Rosendal was just for a few hours. A tiny town with a mountain backdrop. It looked less typical Norsk then many of the places we've been but just as beautiful. In Sirevåg we had an evening deck party as did the few other ships that were there. For a tiny town they sure had a lot of people out to their tall ships event. 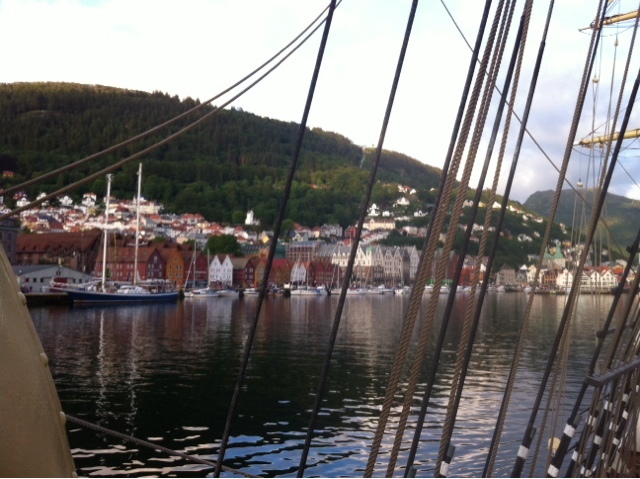 We stopped by Bergen to drop off a trainee and took an evening tour around the harbour (as you do). It was one of my favourite ports last year so nice to be back for a quick look. On this leg galley felt more manageable, like we could work steady, not crazy, and still accomplish what we had to. I think having more… "mature" trainees helped as they were generally more considerate and thoughtful. Anyways it was a welcome change! The Kristiansand festival was madness! Something like 14 events onboard over 4 days! Thankfully not all needed attention from the catering department but even so it meant all departments were stretched a little thin. We had two events with finger food for 150 which requires a lot of prep work, now that we've done it a couple times we know how it's going to go which helps a lot. 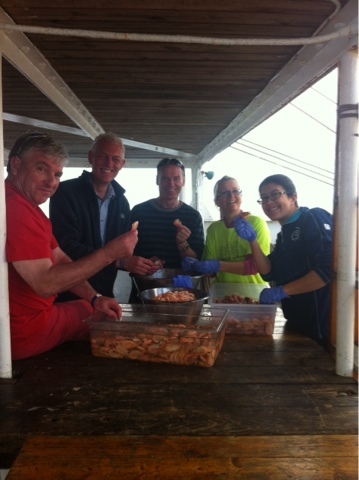 We also had 2 fish soup events and happily I was able to get some trainees to help peel shrimp on the last day of the voyage! One lady had been in a shrimp peeling contest and did 30 shrimp in 4 minutes. 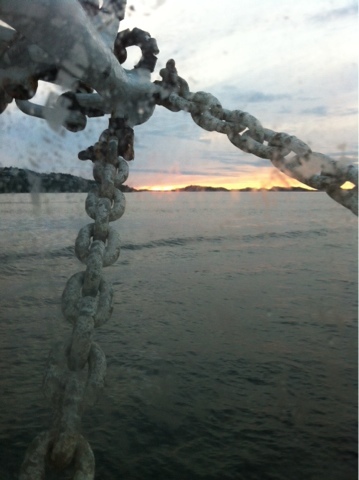 And that is it for shrimp this summer!! My grand total of shrimp peeled is 170 kg. Once we finished these parties we shared some our leftover shrimp with another ship that Carsten used to work on and I gave the cook my shrimpilettes. I hope she wears them with pride! Despite long hours most days I did get a long afternoon break one day. I went to the pool/indoor water park which was free for crew. Mostly I was excited to sit in a hot tub and take a long shower with no water restrictions. Both achieved! I also tried the water slide which was fun. Afterwards I walked around the festival for a bit and saw the awards ceremony where we won Most Spectacular Arrival. (We came in under full sail). I also had the time to visit Meg, one of the AB's from Sørlandet, on Tecla, the boat she's working on this summer. It's a lot smaller than Sørlandet but really cozy feeling. And now we are sailing our second and last race for the summer before a final festival in Aalborg, Denmark and I am counting down the days till I'm home.